Sometimes I just come across a picture that takes me on a journey. 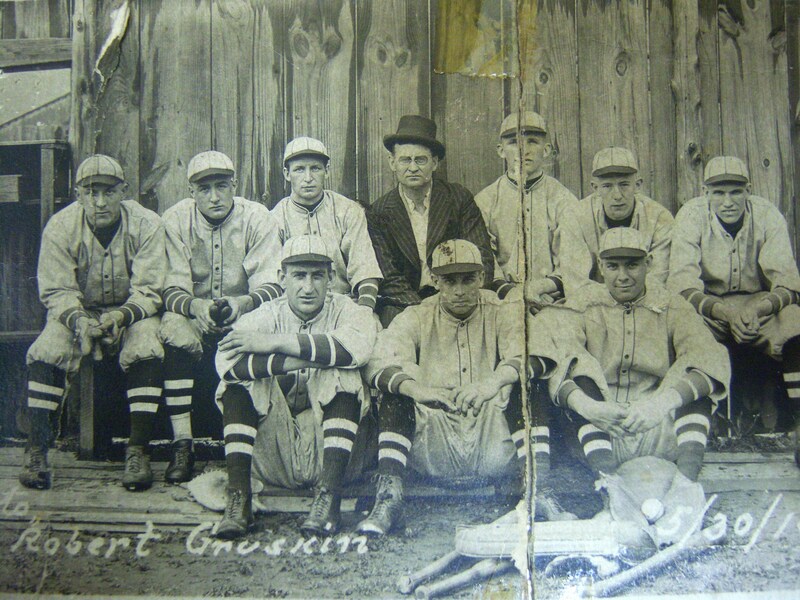 On a visit to the Armstrong County Historical Society I noticed an old baseball team picture on display. This picture was labeled “Mohawk” with a 1918 date. 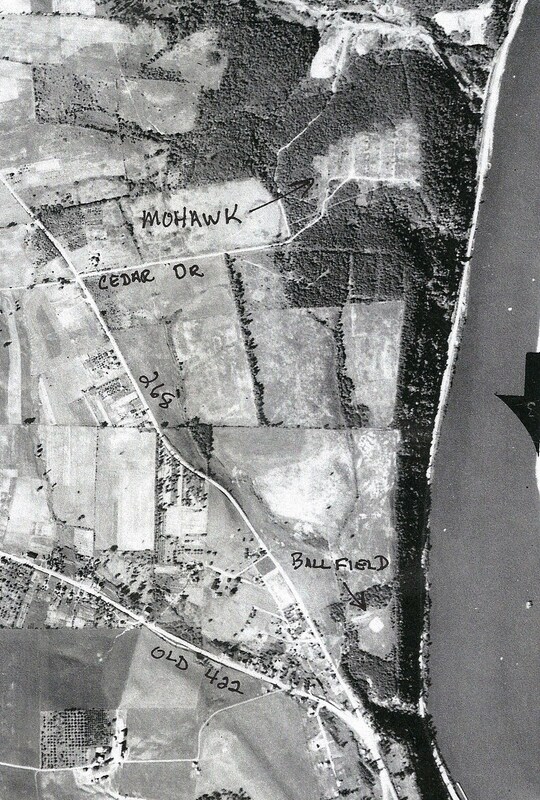 Two things that drew my interest were old time sports teams and Mohawk, which was the old mining town located at Sedwick Heights today. My Lemmon Family living next door to the Mohawk town to the north in Lemmon Hollow, and which my great-grandfather Ross Lemmon made mining posts for the Mohawk mine located there. With the two clues being the names and time period, I was able to find an old newspaper article from the “Peek at the Past” dated June 20, 1919. It indicated the players names and positions the following season from the Mohawk team as; C – Hobaugh, P – Bayne, SS – Hill, 1B – O. French, 2B – Swigart, 3B – Lamberson, RF – Richardson, MF(today centerfield) – Daugherty, LF – Bechtel. I also located an article later in the year as the Manager Dewey Crissman and Jay Swigart folding up the team, known as the “Mohawk Collegians”. A short life, but a picture that will last a lifetime. Some of the known players listed above which led to more information regarding their full names, along with other teams they played with were; Obediah French, almost always listed as a First Baseman, the Shortstop could have been Fred Hill who later joined Jay Swigart on a PPG team. My attempts were to find living relatives to possibly put names with the faces in this rare photo. This led to another discovery. The name that came up quite frequently in my research was Jay Swigart. Listed in several 1915 newspapers as a star Shortstop and Pitcher for Kittanning High School. Here is a newspaper article of one of his games from 1919. I had a conversation with Karl Swigart, I asked him if there was a family connection, he indicated there was no immeditate connection he knew of, but found a Jay Swigart relative with the little information we had to go on. From there quite a remarkable story unfolded. This Jay D. Swigart was from Worthington. 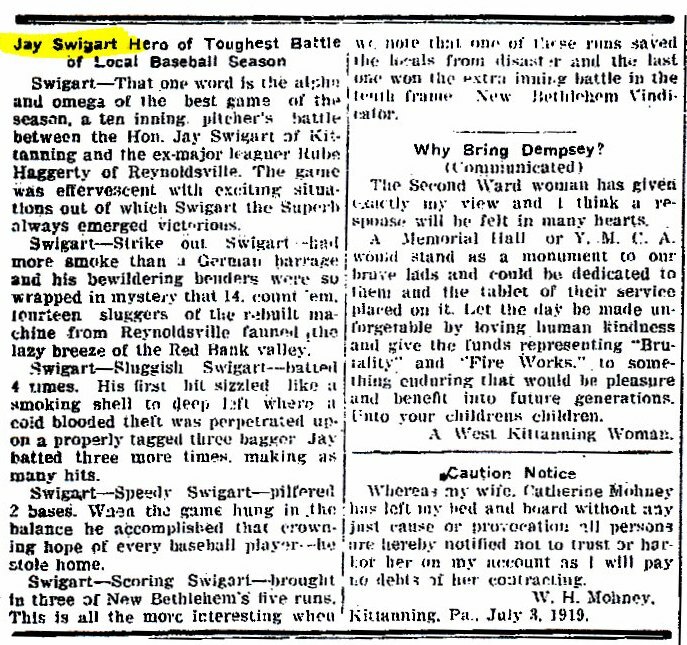 Jay Swigart later moved on to play for several local teams, and a Minor League Professional team into the 1920’s. Not only a Baseball Star but also a Football and Basketball great for Kittanning and Ford City area. He was the 1934 Club Golf Champion at Kittanning Country Club and later other clubs as well. 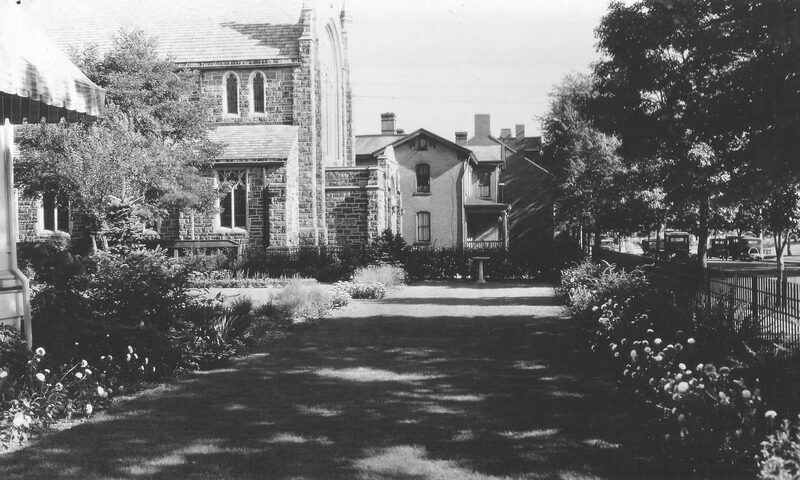 Several articles of interest appeared, such as his introduction into the Armstrong County Hall of Fame in 1974. 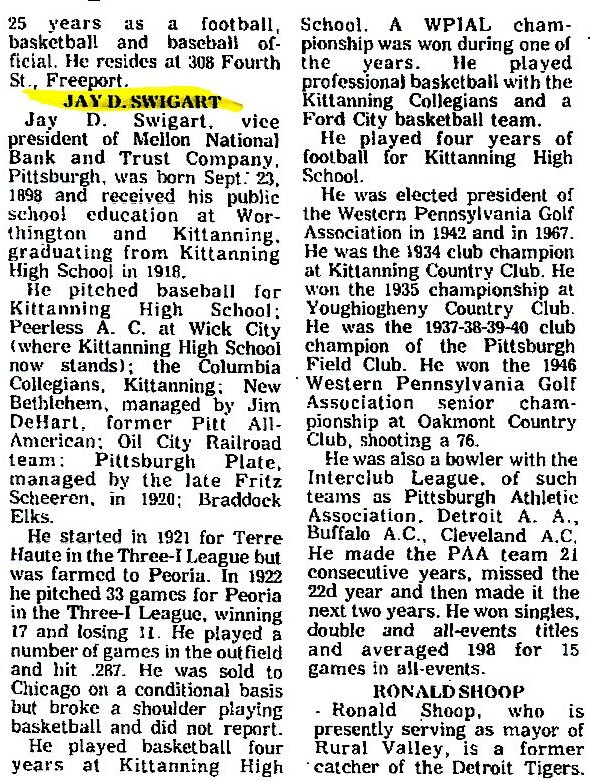 Unfortunately no children were born to Jay D. Swigart and he passed away in 1977. I sure a lot of memorabilia existed and maybe further contact with the relative may confirm him as to which player he was in the 1918 Mohawk photo.